As we went there with Kids, we have rented a Condo, where I have cooked breakfast and one meal at the Condo (esp Kids definitely enjoyed the meal at condo), and we ate once outside every day. We have explored so many differnt restuarants, Coffee shops and Ice Cream shops. Day 1 - when we went to Lighthouse on the North East Shore, there we had lunch at Lighthouse Bistro. When Hubby had Grilled Mahi-Mahi on a snadwhich bread, I had veigge burger wrap with Papaya seed dressing ( which is interesting). Sorry, Couldn't get any pictures though. 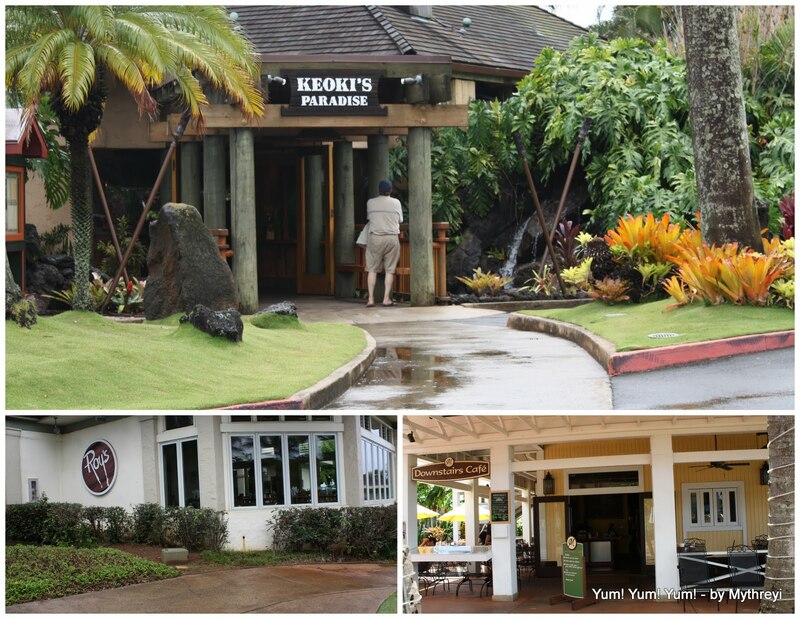 Day 2 - when we are on the way to Canyon, in poipu beach we had lunch at 'Downstairs Cafe', where we have a breathtaking away garden views with full of lush greens. I had Fried Avocado Soft Tacos which are superb, (the Avocados are Hass Avocados local to Hawaii, they are very huge and thick green compared to the Avocado here). Hubby had Grilled Eggplant with Red Pepper Hummus on the Flat Bread along with fresh baby spinach. It was huge, very filling and fantastic. Day 3 - We went to Keiko's Paradise, where the restuarant was decorated like a island and with rain forest theme ( which is full of small waterfalls and orchids all over the place and seating areas are designed like small huts). I simply loved this place. Hubby didn't dare to try their local catch (fish) entrées, usually they serve the local catch ( the fish caught on the same day and they are very expensive also). He ended up ordering Shrimp Basil Pesto Served with Rice Pilaf and Garlic Toast. I have ordered Asian Cashew Chicken which is very good. Our souls and tummy satisfied in this heavenly place. :-). They serve the food with a flower on the side either Orchid or Plumeria. Sorry, the auto flash didn't bring all the colors of this beautiful dish in the picture. Day 5 - We just ate at McDonalds because of Kids Rush. Mine is Veggie Burger - Garden Fresh vegetables, Tofu and Oatmeal Patty served on Fresh Spinach Bed with their secret sauce on the Bun. Not to mention their fries are so goooood. Day 7 - We ate at Taco Bell. Food Chains like McDonalds, Taco Bell and Starbucks same menu as we do see here. But the other restaurants are very unique with their own style of decor and menu choices, they stood at their best and distinct. Lappert's IceCreams is one of the best Icecream and Coffee Shops on the islands. It's a chain store, you can find one in almost every shopping center on the coastal line. Lemon Grass Grill for Asian, Brick Oven Pizza for Italian, Roy's for Hawaiin style are some good eat mentions by locals. But we did not have time to witness these food heavens. I have also seen Curries - Nepali and Indian restaurant and ShivLink is supposed to be the good indian resturant on the island. I have even witnessed the Roy's here on Poipu Beach. I know Roy's from one of our office parties held at 'Roy's Hawaiian Fusion' in Dallas. 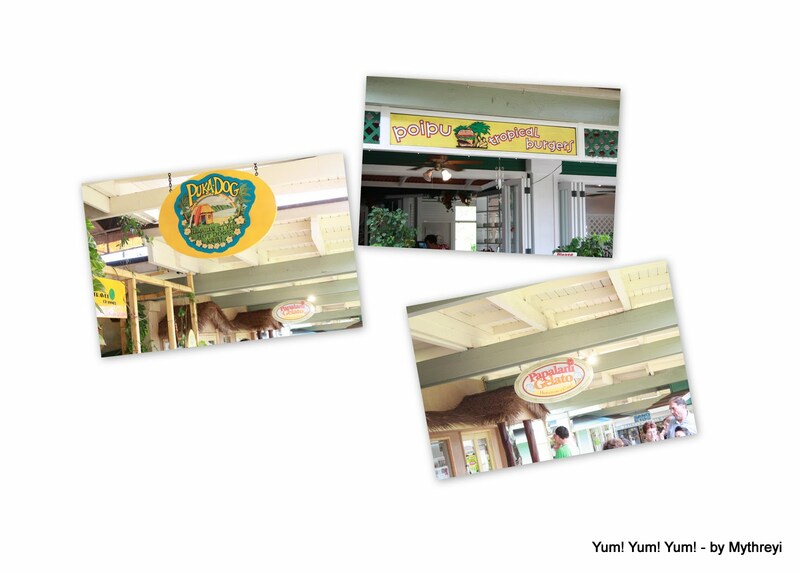 Hope you have enjoyed reading my food heaven (restaurant) experiences in Paradise ( Hawaii). Wait for my next post to take you little more local to Kauai. :-). Nice 2 hear that u had a wonderful vacation..nice post!! Seems u guys had a wonderful vacation there, fabulous dishes,simply delicious.. I've a bunch of awards waiting for in my blog. Pls accept them.